Want to add some strangeness to your line up of Gatlinburg attractions? Look no further than Ripley's Believe It or Not, a wax museum in Gatlinburg that houses several wax statues and a host of other oddities from around the world. When writing up your list of what to do in Gatlinburg, TN while on vacation, make sure to include this curious museum to your itinerary. Ripley's Believe It or Not, one of many vacationers favorite Gatlinburg attractions, carries on the legacy of Robert Ripley, noted cartoonist, reporter, explorer, and adventurer extraordinaire. Robert traveled the world for 35 years looking for strange and unique artifacts from the over 200 countries he visited. Mr. Ripley drew his first Believe It or Not cartoon (which still runs in over 200 papers, in 42 countries, in 17 languages) in 1918. Ripley's influence expanded to radio, where he was a pioneer in onsite reporting, and eventually to television. Ripley even had a short stint as a baseball player on the New York Giants Team. After his travels and numerous adventures, Robert Ripley is quoted to have said that of all the interesting, intriguing, and downright bizarre things he had seen on his travels, the strangest was man. Ripley's Believe It or Not Wax Museum Gatlinburg stands as testament as Ripley's love for the odd. Visitors to this most unique of Gatlinburg attractions can even see a hologram of Mr. Ripley himself. The Oddest of Gatlinburg Attractions- Ripley's Believe It or Not Wax Musuem Gatlinburg! Medieval Torture Devices- Gaze in shock and awe at devices such as the Iron Maiden that were used to torture traitors in the Middle Ages at Ripley's Believe It or Not! Animal Oddities- You'll see two-headed animals, the world's rarest egg, an ostrich skeleton and more at the largest collection of unique animal oddities that can't be found at other Gatlinburg attractions. Vampire Artifacts- Stand in front of a life-size statue of the "Mexican Vampire Woman" at this wax museum in Gatlinburg. Gaze at an authentic vampire hunting kit from the 19th century filled with all sorts of gadgets and tools for finishing off these creatures of the night. Oddities of Man- Prepare yourself for sights unlike any at other Gatlinburg attractions. Ripley's Believe It or Not boasts authentic shrunken heads as well as skulls from the Asmat Tribes, who practiced ritualistic cannibalism, ate brains, and used their victims skulls as pillows! Interactive Exhibits- More than just a wax museum in Gatlinburg, Ripley's Believe It or Not stands above other Gatlinburg attractions with it's entire level of interactive exhibits on the 3rd floor, including a giant Lite Brite and "Operation" style game for kids of all ages to enjoy. No matter what you choose to do at Ripley's Believe It or Not Wax Museum Gatlinburg – it's guaranteed to be one of the most unique experiences you'll have at all the Gatlinburg attractions on your list of what to do in Gatlinburg, TN! 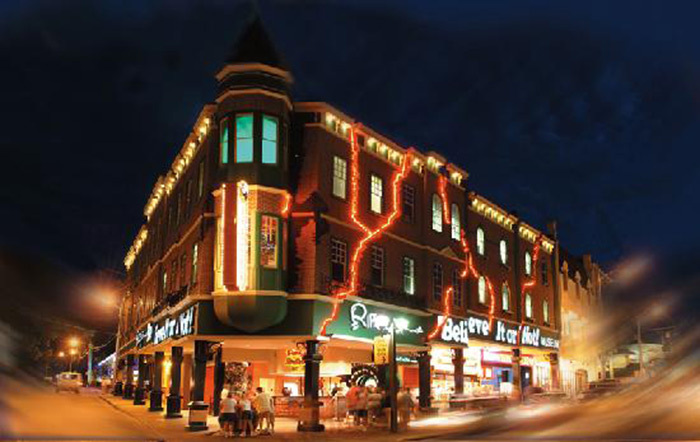 Want to stay close to all the Gatlinburg attractions, including Ripley's Believe It or Not? A stay in one of Cabins USA's Gatlinburg cabin rentals or nearby Pigeon Forge cabins in the Smokies allows guests to enjoy all the comforts and amenities of home as well as enjoy a location that places them near all their "What to Do in Gatlinburg, TN" destinations.